Two Amazing Months with Baby T! I've not blogged for two months and I wish I did because how do I explain in one blog how amazing past two months have been?! But let me tell you... It has been amazingly wonderful and I could not imagine it being any other way. Sure, there were few bumps down the road but that's to be expected for any family who have a new little one in the household! Highlights and lowlights of past two months. * The first couple of weeks flew faster than any other weeks in past two months! We quickly learned that we would not be getting full night of sleep for a while, that getting two girls ready to go takes more time, and that it is hard to get anything done when Tiana smiles and coos to you! First two weeks was definitely an immersion course on all things Tiana! *We were all able to form a strong bond between four of us. It is so special to see just how much Jada and Tiana loves each other. Tiana's face lights up when Jada gets home from school and when daddy comes home from work. It is always the special time of the day. *Tiana got to meet most of her new family and friends. They are very much in love and Tiana really enjoyed the attention! *Tiana got pneumonia. :( This was scary for us and we did have to go to the ER. It took her a while to get better but she is feeling 100% these days! * We were able to meet some of her birth family members and it's just a blessing to know them, to get some pictures and to develop life-long relationships. * We learned that Tiana LOVES the swing, swimming, toys that vibrate or make noises, playing with her toys on the floor, being held, Mozart, Beethoven, and baths! * We learned that Tiana does not like the sun, waiting for her bottle, being in the bumper seat for too long, long days away from home, sudden loud noises, and socks! * In the span of two months, Tiana reached few milestones. Holding her head up, sitting with assistance, understand "milk", "bath", "eat", "play", began to eat solids (still in the exploring phase), recognize faces, say "dadada, aaaaa, doo doo doo", hold items from one hand to other hand, sleep longer, and the list goes on! * We've been working daily on rolling (she can go from back to front then gets stuck), sitting up without assistance and signing as well making more vocal noises. Congrats on the new addition to your family! Sounds like she is settling right in! Glad you were able to figure out the Mr Linky and get on the right post. I saw your comment on the old Mr Linky post from last year - I'm not sure how people are linking to that one, but glad you were able to find the one from this year! 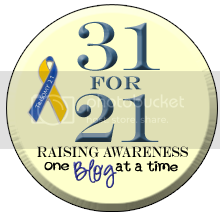 welcome to the 31 for 21 challenge!